Similar to the CR800, except that it has a keyboard display as part of its intergraded package. The CR850 provides a lower-cost datalogger alternative for measurements of a limited number of sensors, yet can be used with most of our telecommunication devices such as cellular telephones, RF UHF/VHF RF modems, and satellite transceivers. 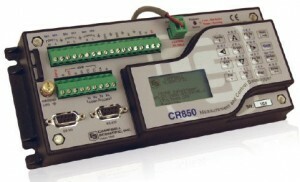 The CR850 datalogger uses external power supplies. The CR850 includes 2 Mbytes of memory for data and program storage. A lithium battery backs up the RAM and real-time clock. The CR850 also suspends execution when primary power drops below 9.6 V, reducing the possibility of inaccurate measurements.